On Sunday April 30th 2017 (Bank holiday Weekend) , Perryway Players attended the World Elver Eating Championships in Frampton on Severn. The event was set up by Frampton Fundraisers in aid of local groups and charities. There are only 7 tickets left for our Opening Night Cafe Style Performance on Wednesday 2nd January. Our ever popular Saturday Matinee performance is also filling up fast. Be sure to book your tickets now via www.perrywayplayers.com or by calling our ticket hotline on 0333 666 3366. 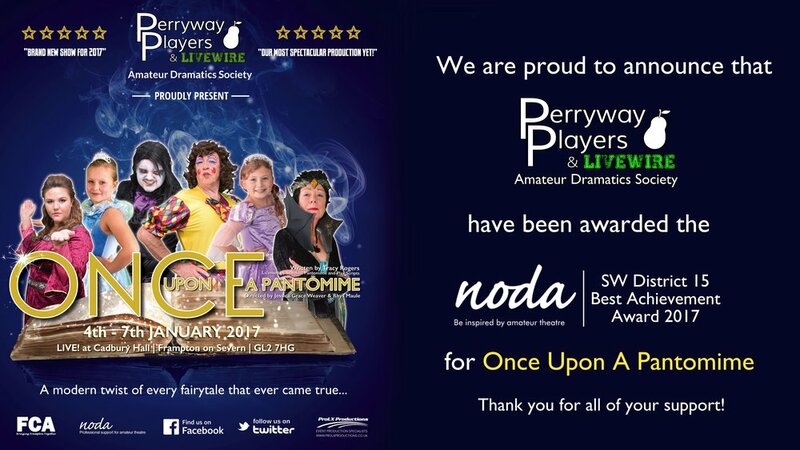 We are extremely proud to announce that Perryway Players & Livewire have been awarded by the National Operatic and Dramatic Association (NODA), Best Achievement Award 2017 South West District 15 for our 2017 Pantomime, Once upon a Pantomime. Written by Tracy Rogers, co-directed by Jessica Grace Weaver and Rhys Maule, the production was performed January 2017 at Cadbury Hall. This was a brand new production which premiered in Bristol and was a first for the Perryway Players. Once Upon A Pantomime, Sponsored by Ley Bistro of Frampton on Severn, was an original pantomime based on the stories of the Brothers Grimm. The plot featured characters from Rapunzel, Rumpelstiltskin, Hansel and Gretal, Snow White and the Seven Dwarves, Cinderella and the Brave Little Tailor. We would to thank everyone who has been involved with the society over the last 3 years and also to our amazing audiences who have made this all possible. Perryway Players will collect the award on Saturday 3rd March 2018 at the NODA Southwest Region Awards evening at the Marriott Hotel, Bristol.